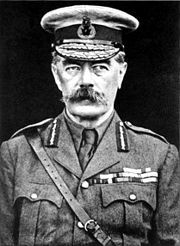 Horatio Herbert Kitchener, 1st Earl Kitchener, KG, KP, GCB, OM, GCSI, GCMG, GCIE, ADC, PC (June 24, 1850 – June 5, 1916) was an Irish-born British Field Marshal, diplomat and statesman popularly referred to as Lord Kitchener. He first came to public notice when he vindicated the defeat and murder of Charles George Gordon in the Sudan. He served with distinction during the Boer Wars, reorganized the Indian Army as its commander-in chief then directed Britain's war effort as Secretary for War during the First World War. Despite accepting his share of the blame for the disastrous Gallipoli campaign, he received praise for his wartime leadership. His image on recruitment posters became almost synonymous with the war itself. He never married and on his death his title passed to his brother. Debate continued regarding his sexual orientation. However, his military ability remains unquestioned and there is no doubt that his wartime leadership greatly aided the Ally's victory. Kitchener was born in Ballylongford, County Kerry, in Ireland, son of Lt. Col. Henry Horatio Kitchener (1805-1894) and Frances Anne Chevallier-Cole (d. 1864; daughter of Rev John Chevallier and his third wife, Elizabeth, née Cole). The family were English, not Anglo-Irish: His father had only recently bought land in Ireland. The year his mother died of tuberculosis, they moved to Switzerland in an effort to improve her condition; the young Kitchener was educated there and at the Royal Military Academy. Pro-French and eager to see action, he joined a French field ambulance unit in the Franco-Prussian War; his father took him back to England after he caught pneumonia. He was commissioned into the Royal Engineers on January 4, 1871. His service in France had violated British neutrality, and he was reprimanded by the Duke of Cambridge, the commander-in-chief. He served in Palestine, Egypt, and Cyprus as a surveyor, learned Arabic, and prepared detailed topographical maps of the areas. He later served as a Vice-Consul in Anatolia, and in 1884, as an Aide de Camp during the failed Gordon relief expedition in the Sudan. At this time his fiancée, and possibly the only female love of his life, Hermione Baker, died of typhoid fever in Cairo; he subsequently had no issue. But he raised his young cousin, Bertha Chevallier-Boutell, daughter of Kitchener's first-cousin, Sir Francis Hepburn de Chevallier-Boutell. In 1874, at age 24, Kitchener was assigned by the Palestine Exploration Fund to a mapping-survey of the Holy Land, replacing Charles Tyrwhitt-Drake, who had died of malaria (Silberman 1982). Kitchener, then an officer in the Royal Engineers, joined fellow Royal Engineer Claude R. Conder and between 1874 and 1877, they surveyed what is today Israel, the West Bank and Gaza, returning to England only briefly in 1875, after an attack by locals in the Galilee, at Safed (Silberman 1982). Conder and Kitchener’s expedition became known as the Survey of Western Palestine because it was largely confined to the area west of the Jordan River (Hodson 1997). The survey collected data on the topography and toponymy of the area, as well as local flora and fauna. The results of the survey were published in an eight volume series, with Kitchener’s contribution in the first three tomes (Conder and Kitchener 1881-1885). The ordnance survey serves as the basis for the grid system used in the modern maps of Israel and Palestine. The collection of data compiled by Conder and Kitchener are still consulted by archaeologists and geographers working in the southern Levant. The survey itself effectively delineated and defined the political borders of the southern Levant. For instance, the modern border between Israel and Lebanon is established at the point in the upper Galilee where Conder and Kitchener’s survey stopped. He won national fame on his second tour in the Sudan (1886–1899), being made Aide de Camp to Queen Victoria and collecting a Knighthood of the Bath. After becoming Sirdar of the Egyptian Army he headed the victorious Anglo-Egyptian army at the Battle of Omdurman on September 2, 1898, a victory made possible by the massive rail construction program he had instituted in the area. This was regarded as vindicating the defeat and probable execution of Charles George Gordon by the Mahdi of Sudan. His ability to speak Arabic was a skill he put to good use, transforming his Egyptian troops into a disciplined fighting force. Kitchener quite possibly prevented war between France and Britain when he dealt firmly but non-violently with the French military expedition to claim Fashoda, in what became known as the Fashoda Incident, involving British-French territorial rivalry. The decision to use the source of the Nile and Congo rivers to demarcate the French from the British imperial zones avoided war. 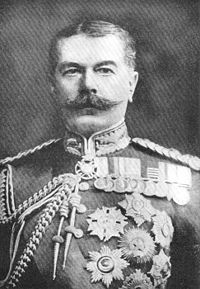 He was created Baron Kitchener, of Khartoum and of Aspall in the County of Suffolk, on November 18, 1898, as a victory title commemorating his successes, and began a program restoring good governance to the Sudan. The program had a strong foundation based on education, Gordon Memorial College being its centerpiece, and not simply for the children of the local elites—children from anywhere could apply to study. He ordered the mosques of Khartoum rebuilt and instituted reforms which recognized Friday—the Muslim holy day—as the official day of rest, and guaranteed freedom of religion to all citizens of the Sudan. He went so far as to prevent evangelical Christian missionaries from attempting to convert Muslims to Christianity. 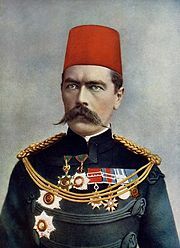 Kitchener rescued a substantial charitable fund which had been diverted into the pockets of the Khedive of Egypt, and put it to use improving the lives of the ordinary Sudanese. He also reformed the debt laws, preventing rapacious moneylenders from stripping away all assets of impoverished farmers, guaranteeing them five acres (20,000 m²) of land to farm for themselves and the tools to farm with. In 1899, Kitchener was presented with a small island in the Nile at Aswan as in gratitude for his services; the island was renamed Kitchener's Island in his honor. During the Second Boer War (1899–1902), Kitchener arrived with Lord Roberts and the massive British reinforcements of December 1899. Kitchener was made overall commander in November 1900 following Roberts' removal due to illness. Following the defeat of the conventional Boer forces, and the failure of a reconciliatory peace treaty in February 1901 (due to British cabinet veto) that Kitchener had negotiated with the Boer leaders, Kitchener inherited and expanded the successful strategies devised by Roberts to crush the Boer guerrillas. In a brutal campaign, these strategies removed civilian support from the Boers with a scorched earth policy of destroying Boer farms, building blockhouses, and moving civilians into concentration camps. Conditions in these camps, which had been conceived by Roberts as a form of humanitarian aid to the families whose farms he had destroyed, began to rapidly degenerate as the large influx of Boers outstripped the minuscule ability of the British to cope. Despite being largely rectified by late 1901, they led to wide opprobrium in Britain and Europe, but especially amongst South Africans. This was due to the fact that the conditions in the camps were atrocious, for every 1000 people 344 would die. This was mainly due to the fact that the concentration camps were overcrowded. Because of this there was poor sanitation, food shortages, and rampant diseases which spread as there was no medicine or medical care. Their biggest critic was Cornish humanitarian and welfare worker Emily Hobhouse. The Boer commandos had no uniforms—they fought in their ordinary civilian attire. On long service, as the state of their clothing became progressively worse, many resorted to taking the clothes of captured troops. This was widely perceived by British commanders as an attempt to masquerade as British soldiers in order to gain a tactical advantage in battle; in response Kitchener ordered that Boers found wearing British uniforms were to be tried on the spot and the sentence, death, confirmed by the commanding officer. This order—which Kitchener later denied issuing—led to the famous Breaker Morant case, in which several Australian soldiers, including the celebrated horseman and bush poet Lt. Harry "Breaker" Morant, were arrested and court-martialled for summarily executing Boer prisoners and also for the murder of a German missionary believed to be a Boer sympathizer. Morant and another Australian, Lt. Peter Handcock, were found guilty, sentenced to death and shot by firing squad at Pietersburg on February 27, 1902. Their death warrants were personally signed by Kitchener. The trial and execution remain controversial, especially in Australia, where it is widely believed that the court-martial was a sham, rigged for a predetermined conviction, that Kitchener disappeared on tour immediately following the trial in order to prevent a last-minute appeal, and that Morant and Handcock were scapegoats who unfairly took the blame for the killings in order to cover up the extent of Kitchener's no prisoners policy. The defense attorney for Morant, Handcock and Witton, Major JF Thomas, a small time attorney with no courts-martial experience, was given only one day to prepare for the case and all witnesses that might have exonerated the trio were suddenly and conveniently transferred by Kitchener to other inaccessible parts of the British Empire. After the trial there was an attempt made by Kitchener and the British Army to cover up the affair. This situation has been exacerbated by the mysterious and unexplained loss of the court-martial documents relating to the case, leaving only a book written by one of the defendants who survived the trial, George Witton, as primary evidence of the proceedings. Witton's book was entitled, Scapegoats of the Empire and later turned into major motion picture and Oscar winning film (best adapted screenplay, 1980) entitled, "Breaker Morant." The Treaty of Vereeniging was signed in 1902, following a tense six months. During this period Kitchener struggled against Sir Alfred Milner, the Governor of the Cape Colony and the British government. Milner was a hardline conservative and wanted to forcibly anglicize the Afrikaners, Kitchener wanted a compromise peace treaty that would recognize certain rights for the Afrikaners and promise future self-government, whereas Milner and the British government wanted to force a humiliating peace treaty upon the Boers, eventually the British government had no choice but to side with Kitchener against Milner because the war was going on too long. (Louis Botha, the Boer leader with whom Kitchener negotiated his aborted peace treaty in 1901, became the first Prime Minister of the self-governing Union of South Africa in 1910.) The Treaty also agreed to pay for reconstruction following the end of hostilities. Six days later Kitchener was created Viscount Kitchener, of Khartoum and of the Vaal in the Colony of Transvaal and of Aspall in the County of Suffolk. Following this, Kitchener was made Commander-in-Chief in India (1902–1909), where he reconstructed the greatly disorganised Indian army, against the wishes of the bellicose viceroy Lord Curzon of Kedleston, who became a passionate and lifelong enemy. Kitchener was promoted to the highest Army rank, field marshal, in 1910; however, largely due to a Curzon-inspired whispering campaign, he was turned down for the post of Viceroy of India in 1911. He then returned to Egypt as British Governor General of Egypt and the Sudan (1911–1914, during the formal reign of Abbas Hilmi II as Khedive (nominally Ottoman Viceroy) of Egypt, Sovereign of Nubia, of the Sudan, of Kordofan and of Darfur). He was created Earl Kitchener, of Khartoum and of Broome in the County of Kent, on June 29, 1914. Unusually, provision was made for the title to be passed on to his brother and nephew, since Kitchener was not married and had no children. 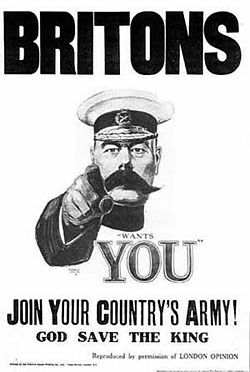 The much-imitated 1914 Lord Kitchener Wants You poster. At the outset of World War I, the Prime Minister, H. H. Asquith, quickly had Lord Kitchener appointed Secretary of State for War. Against cabinet opinion, Kitchener correctly predicted a long war that would last at least three years, require huge new armies to defeat Germany, and suffer huge casualties before the end would come. Smelling blood in the wind, Kitchener stated that the conflict would plumb the depths of manpower "to the last million." A massive recruitment campaign began, which soon featured a distinctive poster of himself, taken from a magazine front cover. It may have encouraged large numbers of volunteers and has proven to be one of the most enduring images of the war, having been copied and parodied many times since. In an effort to find a way to relieve pressure on the Western front, Lord Kitchener proposed an invasion of İskenderun with Australian and New Zealand Army Corps (ANZAC), New Army, and Indian troops. Alexandretta was an area with a large Christian population and was the strategic center of the Ottoman Empire's railway network—its capture would have cut the empire in two. Yet he was instead eventually persuaded to support Winston Churchill's disastrous Gallipoli campaign in 1915–1916. That failure, combined with the Shell Crisis of 1915, was to deal Kitchener's political reputation a heavy blow; he offered to resign, but Asquith refused, although responsibility for munitions was moved to a new ministry headed by David Lloyd George. In May 1916, preparations were made for Kitchener and Lloyd George to visit Russia on a diplomatic mission. Lloyd George was otherwise engaged with his new Ministry and so it was decided to send Kitchener alone. A week before his death, Kitchener confided to Lord Derby that he intended to press relentlessly for a peace of reconciliation, regardless of his position, when the war was over, as he feared that the politicians would make a bad peace. On June 4, 1916, Lord Kitchener personally answered questions asked by politicians about his running of the war effort; at the start of hostilities Kitchener had ordered two million rifles with various U.S. arms manufacturers. Only 480 of these rifles had arrived in the UK by June 4, 1916. The numbers of shells supplied were no less paltry. Kitchener explained the efforts he had made in order to secure alternative supplies. He received a resounding vote of thanks from the 200+ Members of Parliament who had arrived to question him, both for his candor and for his efforts to keep the troops armed; Sir George Arthur, who, a week before, had introduced the failed vote of censure in the House of Commons against Kitchener's running of the War Department, personally seconded the motion. At Scapa Flow, Lord Kitchener embarked aboard the armored cruiser HMS Hampshire for his diplomatic mission to Russia. On 5 June 1916, while en route to the Russian port of Arkhangelsk, Hampshire struck a mine laid by the newly-launched German U-boat U-75 (commanded by Kurt Beitzen) during a Force 9 gale and sank west of the Orkney Islands. Kitchener, his staff, and 643 of the crew of 655 were drowned or died of exposure. His body was never found. The survivors who caught sight of him in those last moments testified to his outward calm and resolution. The same day, the last Division of Kitchener's New Army crossed the channel to take up its positions in Flanders and France where, eventually, and despite numerous setbacks, they helped to defeat Germany in 1918. Fritz Joubert Du Quesne, a Boer and German spy, claimed to have sabotaged and sunk the HMS Hampshire, killing Kitchener and most of the crew. According to German records, Du Quesne assumed the identity of Russian Duke Boris Zakrevsky and joined Kitchener in Scotland. On route to Russia, Du Quesne signaled a German U-boat to alert them that Kitchener’s ship was approaching. He then escaped on a raft just before the Hampshire was destroyed. Du Quesne was awarded the Iron Cross for this act. Following his death the town of Berlin, Ontario, Canada, was renamed Kitchener in his honor. Mount Kitchener in the Canadian Rockies was also named in his honor. A memorial was erected in his honor on the nearby cliffs. In the City of Geelong, Victoria, Australia, the Kitchener Memorial Hospital was named in his honour. It is now known as Geelong Hospital. The original building is still in use although it no longer houses patients. A month after his death the Lord Kitchener National Memorial Fund was set up by the Lord Mayor of London to honour his memory. It was used to aid casualties of the war, both practically and financially; following the war's end, the fund was used to enable university educations for soldiers, ex-soldiers, and their sons, a function it continues to perform today. Some biographers have suggested that Kitchener was a latent or active homosexual, though this is heavily disputed. Writers that make the case for his homosexuality include Montgomery Hyde and Richardson. Biographers who make the case against include Cassar, Pollock, and Warner. Magnus and Royle hint at homosexuality, though Magnus is said to have later recanted. The proponents of the case point to Kitchener's friend, Captain Oswald Fitzgerald, whom he appointed his aide-de-camp. They remained close until they met a common death on their voyage to Russia. From his time in Egypt in 1892, he gathered around him a cadre of eager young officers nicknamed "Kitchener's band of boys." A contemporary journalist remarked that Kitchener "has the failing acquired by most of the Egyptian officers, a taste for buggery." However, he was apparently in love with, and may have been engaged to, Hermione Baker, the beautiful young daughter of Valentine Baker, commander of the Egyptian gendarmarie, but she died from typhoid in January 1885, aged eighteen. In 1902, he unsuccessfully courted Lord Londonderry's daughter, Helen Mary Theresa. He was friendly, in her old age, with the courtesan Catherine Walters. The suddenness of Kitchener's death, combined with his great fame and the fact that his body was never recovered, almost immediately gave rise to conspiracy theories that have continued almost to this day. The fact that newly-appointed Minister of Munitions (and future prime minister) David Lloyd George was supposed to accompany Kitchener on the fatal journey, but canceled at the last moment, has been given great significance by some. This fact, along with the alleged lethargy of the rescue efforts, has led some to claim that Kitchener was assassinated, or, somewhat more plausibly, that his death would have been convenient for a British establishment that had come to see him as figure from the past who was incompetent to wage modern war. Given that Kitchener's death hit Britain like a thunderclap and was widely perceived as a disaster for the war effort, this interpretation seems far-fetched, to say the least. After the war, there were a number of conspiracy theories put forward, one by Lord Alfred Douglas, positing a connection between Kitchener's death, the recent naval Battle of Jutland, Winston Churchill, and a Jewish conspiracy. (Churchill successfully sued Douglas for criminal libel and the latter spent six months in prison.) Another claimed that the Hampshire did not strike a mine at all, but was sunk by explosives secreted in the vessel by Irish Republicans. Probably the most spectacular Kitchener-related conspiracy was the effort in 1926, by a hoaxer named Frank Power to actually recover and bury Kitchener's body, which he claimed had been found by a Norwegian fisherman. He brought a coffin back from Norway and prepared it for burial in St. Paul's. At this point, however, the authorities intervened and the coffin was opened in the presence of police and a distinguished pathologist. The box was found to contain only tar for weight. There was widespread public outrage at Power, but he was ultimately never prosecuted. Kitchener's name is allmost synominous with Britain's effort in World War I. His leadership played a significant role in the Allied victory over Germany and the Ottoman Empire. He may properly be considered one of the greatest British generals. On the one hand, he was brutal as a soldier, pursuing his scorched-earth policy while on the other hand he did much to improve the lives of the Sudanese people, supporting philanthropic causes. Kitchener is a Senior Boys house at the Duke of York's Royal Military School, where, like Welbeck college all houses are named after prominent military figures. ↑ H. Montgomery Hyde, The Love That Dared not Speak its Name, 161. ↑ Frank McLynn, England needs you, New Statesman. Retrieved May 18, 2007. ↑ Patrick Barkham, Navy's new message: Your country needs you, especially if you are gay. Retrieved May 17, 2007. ↑ Niall Ferguson, A walking, talking ramrod? The Telegraph. Retrieved May 18, 2007. Ballard, Brigadier General Colin Robert. Kitchener. London: Faber and Faber, 1930. Cassar, George. Kitchener: Architect of Victory. London: Kimber, 1977. ISBN 9780718303358. Conder, C.R., and H. H. Kitchener. Survey of Western Palestine: Memoirs of Topography, Orography, Hydrography and Archaeology. London: Palestine Exploration Fund, 1881. Hodson, Yolande. "Kitchener, Horatio Herbert," in Eric M. Meyers (ed. ), The Oxford Encyclopedia of Archaeology in the Near East. New York: Oxford University Press, 1997. ISBN 0-19-511217-2. King, P. The Viceroy's Fall: How Kitchener destroyed Curzon. London: Sidgwick & Jackson, 1986. ISBN 9780283993138. Magnus, Philip. Kitchener: Portrait of an Imperialist. London: John Murray, 1958. McCormick, D. The Mystery of Lord Kitchener's Death. London: Putnam, 1959. Montgomery Hyde, Harford. The Other Love: An Historical and Contemporary Survey of Homosexuality in Britain. London: Mayflower Books Ltd, 1972. ISBN 9780583120739. Pollock, John. Kitchener: Architect of Victory, Artisan of Peace. New York: Carroll & Graf Publishers, 2001. ISBN 0-7867-0829-8. Richardson, Major-General Frank M. Mars Without Venus: A Study of Some Homosexual Generals. Edinburgh: W. Blackwood, 1981. ISBN 9780851581484. Royle, Trevor. The Kitchener Enigma. London: Michael Joseph, 1985. ISBN 9780718123857. Neil Asher Silberman. Digging for God and Country: Exploration, Archaeology and the Secret Struggle for the Holy Land 1799–1917. New York: Alfred A. Knopf, 1982. ISBN 0-394-51139-5. Warner, Philip. Kitchener: The Man Behind the Legend. London: Cassell New edition, 2006. ISBN 0-304-36720-6. History of "Herbert Kitchener, 1st Earl Kitchener"
This page was last modified on 20 December 2017, at 15:12.